The 2018 IFBB Arnold Classic and Arnold Sports Festival are Presented by Classic Productions. Celebrating the 30th Anniversary of the IFBB Arnold Classic and the 12th Arnold Amateur Championships. March 1st - 4th, 2018, Columbus, Ohio. Held at the Greater Columbus Convention Center and the Battelle Grand Ballroom. 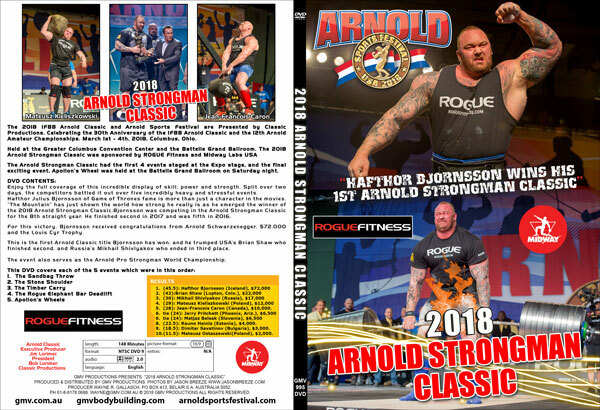 The 2018 Arnold Strongman Classic was sponsored by ROGUE Fitness and Midway Labs USA. The Arnold Strongman Classic had the first 4 events staged at the Expo stage, and the final exciting event, Apollon’s Wheel was held at the Battelle Grand Ballroom on Saturday night. See the COMPLETE RESULTS FOR EVERY PRO CLASS AT THE 2018 EVENT. Enjoy the full coverage of this incredible display of skill, power and strength. Split over two days, the competitors battled it out over five incredibly heavy and stressful events. Hafthor Julius Bjornsson of Game of Thrones fame is more than just a character in the movies. “The Mountain” has just shown the world how strong he really is as he emerged the winner of the 2018 Arnold Strongman Classic. Bjornsson was competing in the Arnold Strongman Classic for the 8th straight year. He finished second in 2017 and was fifth in 2016. For this victory, Bjornsson received congratulations from Arnold Schwarzenegger, $72,000 and the Louis Cyr Trophy. This is the first Arnold Classic title Bjornsson has won, and he trumped USA’s Brian Shaw who finished second, and Russia’s Mikhail Shivlyakov who ended in third place. The event also serves as the Arnold Pro Strongman World Championship. 5th place (28): Jean-Francois Caron (Canada), $10,000. 8th place (22.5): Rauno Heinla (Estonia), $4,000. 9th place (18.5): Dimitar Savatinov (Bulgaria), $3,000. 10th place (11.5): Mateusz Ostaszewski (Poland), $2,000. In the final event during the Arnold Classic Finals at Battelle Grand, Bjornsson and Shaw each pressed the 400-pound Apollon’s Wheel overhead three times in the allotted two minutes to finish tied for first. Bjornsson entered the final event only needing one rep to claim the title, but put the famed ROGUE Fitness apparatus overhead four times to the delight of the sold-out crowd. However, the 4th overhead by Bjornsson did not get the official OK from the referee. Bjornsson set a new world record in the ROGUE Elephant Bar Deadlift by hoisting an amazing 1,041 pounds. Shaw was second with a lift of 1,016 pounds. Bjornsson also won the Bag Over the Bar by tossing a 95-pound, custom-made ROGUE Fitness bag over a 15-foot-high bar. Mateusz Kieliszkowski of Poland won The Stone Shoulder by lifting the 410-pound rock four times while Jerry Pritchett of the USA won the Timber Carry by moving the 1,102-pound wooden frame up a 35-foot ramp in an amazing 9.58 seconds.